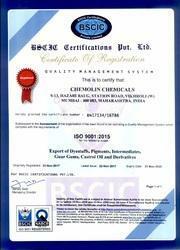 Chemolin Chemicals Group Of Companies established in the year 2003 for ourselves an immense and well established infrastructural set up which is well equipped with all the advanced Machineries. Besides this, all the machines installed at our unit are in line with the latest market developments. Moreover, these are updated from time to time so as to maintain our synchronization with changing market trends. Working efficiently in a coordinated manner, our skilled team is highly versed with the knowledge of this domain and is enabling us to complete all our tasks within the promised time. We are exporting our products all over the world. Kiran M. Desai Chairman of the Company who is B.Tech. Chemical Eng. Specialisation food Technology from UDCT, Mumbai with more than 39 years association in this industry. He also worked with M/s.Indian Gum Industries Ltd, (Lucid Colloid) as General Manager and M/s.India Glycol Ltd (Guar Gum Div.) as President. 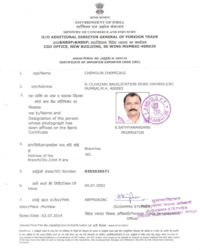 S. Sathyanandan, Managing Director of the Company who is a Com. Graduate with Diploma in International Trade looks after the Sales / Exports of our Products, he has over 23 year Experience in the same Industry. Nikhil M. Shah Director of the Company who is a Chemical Engineer with more than 15 year association in this Industry have assisting the Company on different stages of production and post-production tasks. 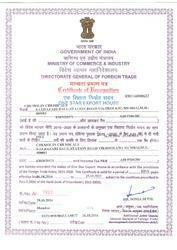 CHEMEXCILis an Export Promotion Council, set up by Ministry of Commerce & Industry Govt. of India. 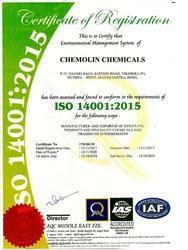 Chemolin Chemicals Group Of Companies are dedicated towards customer satisfaction by delivering best quality Products at competitive costs. We visualizes in developing next generation products, which will enable it to stay ahead of competitors in the times to come. CHEMSPEC Europe 2012 -------------------------- 13th-14th June' 2012, Barcelona, Spain. TURKCHEM EURASIA,(CHEMSHOW EURASIA) -- 11th to 14th October'2012, Istanbul, Turkey. Our company’s commitment to become a cost effective manufacturer is underpinned by our highly advanced infrastructure that consists of modernized R&D and innovative manufacturing facilities. We have invested heavily in implementing prevailing technology that exhibits the international standards. Further, excellent infrastructural setup includes most modern production equipments, process and quality control instruments, and continuously updated units for research, manufacturing, stocking, packaging and distribution. Chemofine Dyes & Chemicals Pvt. Ltd.
Kiran M. Desai Chairman of the Company who is B.Tech. Chemical Eng. Specialization food Technology from UDCT, Mumbai with more than 39 years association in this industry. He also worked with M/s.Indian Gum Industries Ltd, (Lucid Colloid) as General Manager and M/s.India Glycol Ltd (Guar Gum Div.) as President.